So no, I’m not actually playing Rugby. Just a play on words and fashion. Much like last fall, I’m bringing out another wide stripe piece that is also known as the Rugby Stripe. Stripes go with anything, however I decided to keep this look simple. 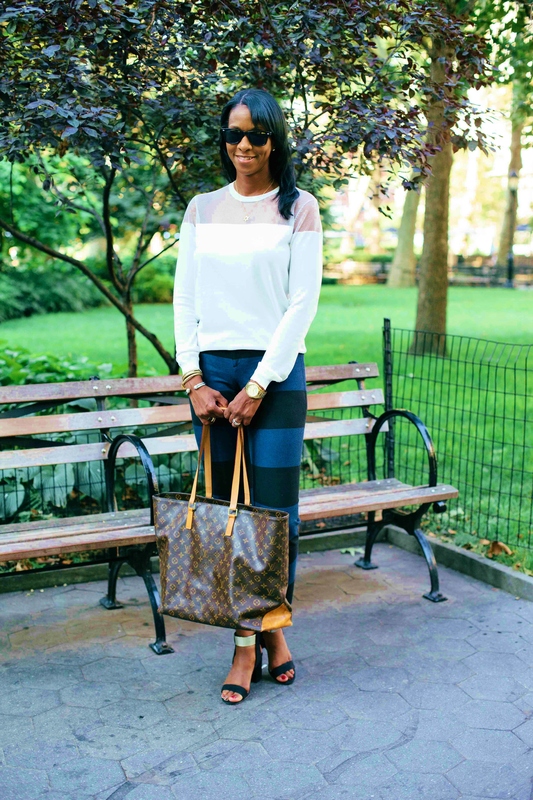 Sheer horizontal panel sweater, stove-pipe heel sandal with gold accent and tote. 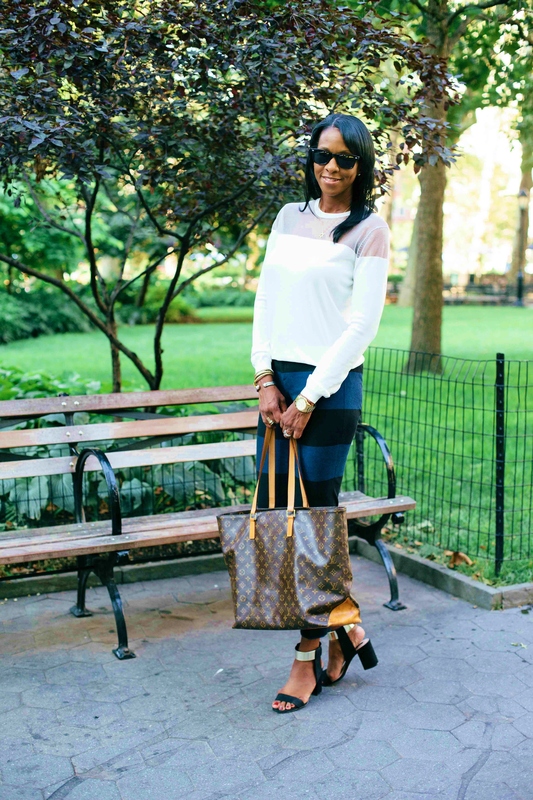 With this look, the most special piece is my Louis Vuitton (LV) tote. The Cabos Alto tote is one of the best pieces LV has ever made. (Other than those gorgeous LV trunks). I purchased this tote over 10yrs ago and I’m glad I did. Production of this tote stopped about 8yrs ago. According to the floor manager at the LV boutique in Saks Fifth Avenue – NYC, Angelina Jolie was the last person to purchase one. Apparently Angelina wanted it as a diaper bag. I suppose I’m in good company. I’m proud to be the owner of such a fantastic bag. 99% of the time, I’m the only person on the street with one. Every where you look, girls are walking around with the same Neverfull GM tote. I’m assuming because it’s modestly priced, that’s why it’s so over exposed. With that said, over exposed or not, LV is the best quality on the market. Last August one of my straps broke. 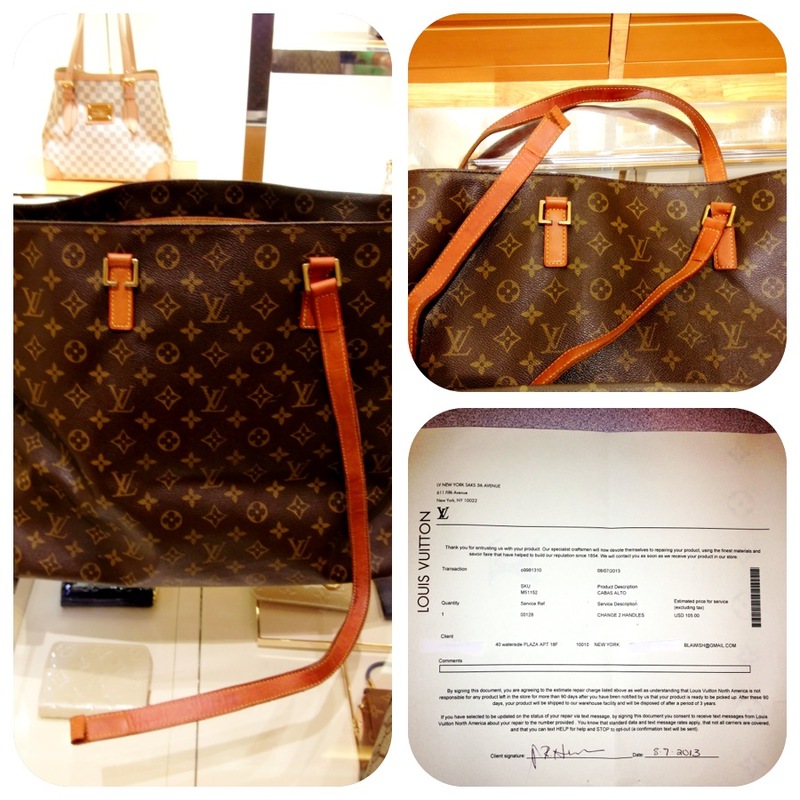 Immediately I took it in to LV to have it refurbished. Three weeks later my bag was ready to be picked up. It’s taken almost a year for the leather to darken. Unfortunately, still not as dark as the rest of the leather accent pieces but it’s getting there. i love your style !!! You’re too kind. Thank you so much. Ohh I love the detailing on this top! I’m in love with the whole outfit! These pants are amazing! You look gorgeous! I am literally drooling over your LV! Thank you. Made a comment on your wordpress blog but for some reason it won’t allow me. It’s not recognizing my login info. Weird. I love the pants. Do not forget to follow for a chance to win a pair of Chopard Sunglasses ($500.00 Value). This dark version looks really lovely! Love your pants as well! P.S. Thank you for commenting on my blog! Thank very much. As for you blog, not a problem. 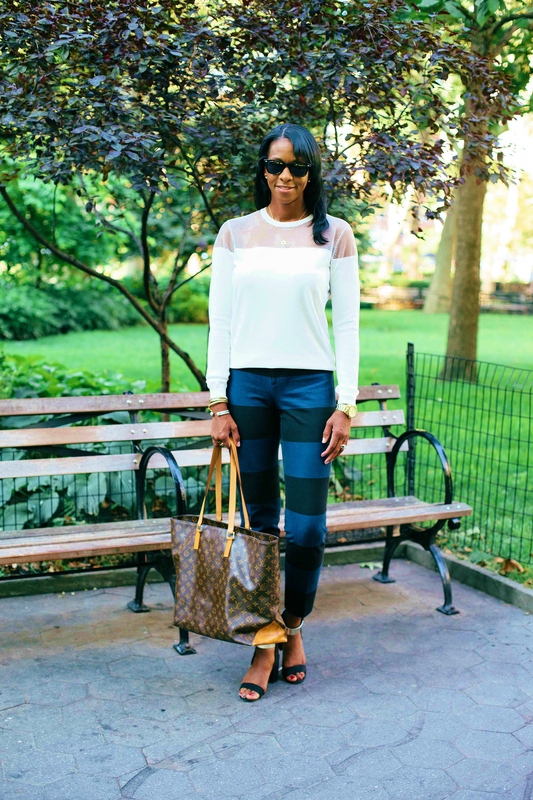 Love the pants on you, especially mixed with this sporty top ! OH my goodness these pants are too good! You look amazing! Thanks for your comments on my blog! I’m so glad I found yours–it’s phenomenal! Keep up the great work. My pleasure. Thanks for the encouraging words. I like the way you styled with feminine top.OMG !! !love the look!!!! Check out my new post! Yes, you are correct. She did that LV campaign long after she had got that particular tote & after it was out of production. In that campaign, she used her own bag. As for the N.F. tote, it comes in 3 sizes so maybe one of the smaller ones would be better suited for you. Thanks for checking out my post.